Last night I had this brilliant idea that JG and I should get up early (4 ish) and go for an early morning hike – maybe even catch the sunrise. He reluctantly agreed. I woke up at 3:50 a.m. and decided to lay there just a little longer – which turned out to be 4:45. Okay, we might not see the sunrise on top of a mountain, but it’s still early enough to beat the crowds. We decided on Peaks of Otter – Sharp Top. This is a hike I had not tried, however, I have hiked it’s twin – Flat Top twice. As we headed down the Interstate, we saw the fog interfere with the sunrise. We arrived as the first wave of early morning hikers were about to leave the parking lot. I had not attempted this hike before because even though it is only 3 miles round trip, it is very steep, rocky, and every book has it listed as “strenuous.” But today I was feeling frisky and while it was a major “huff and puff” going up, we made it. It was quite humid, so we are pretty much soaked by the time we reach the top. Even though it was a bit hazy, it was a very rewarding vista. It was a wonderful way to celebrate our nation’s birth. I haven’t been such a proud American lately, at least not politically. But the mountains remind me that there is so much more to this great country of ours than a few bad seeds in Washington. Now I am completely exhausted and achy, so I plan to spend the rest of the day with my feet propped up. Hope you all are having a good day! Happy 4th. You got great views for your effort. I’m very impressed with your effort – what a fabulous view! Is that a rooftop and chimney in one of those photos? Who lives there? What do they do? Wouldn’t it be a fabulous place to live! It’s good to remember that 45 will pass eventually along with all his iniquities – the land will endure! There is a little cabin/shelter at the top – some hikers use it for the rain and I think it can be used for camping. I read that they are going to try to update it. It just added to the picture. 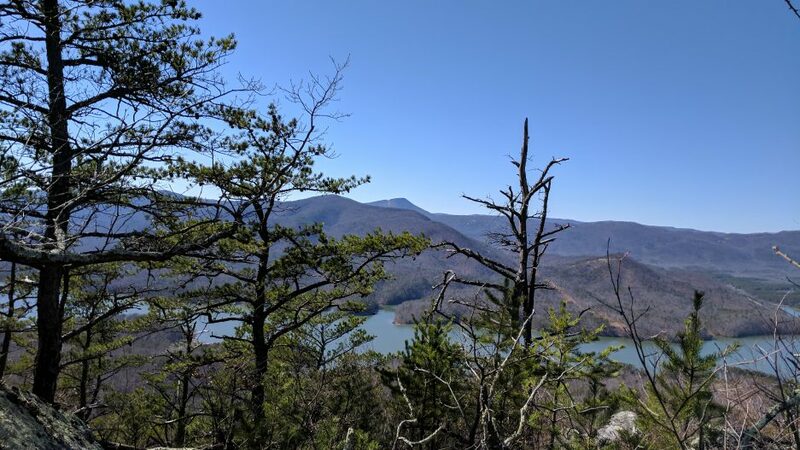 Thanks Joanne – I actually passed a woman who was 1 week away from delivering her second child – she does this hike all the time and had hiked it right before her first child was born. It was a bit intimidating. Nevertheless, I was proud that I made it to the top. At least you passed her! I had to smile at you waking up, and then actually getting up about an hour later. That happens to me all the time, even with my good intentions. Sleep is the master of all, especially when you’re home in in your own comfortable bed. I’m glad you enjoyed the hike and what a way to challenge yourself. What spectacular views! I’m glad you found a way to celebrate on the 4th that is meaningful to you. Thanks Alys, yes, sleep usually wins. Those views are breathtaking! Hiking and walking in general are my favorite hobbies and help me relax, so I understand how you felt after the hike even if you had some aches and pains. Exactly, some pains are worth it. 3 weeks later and I am catching up on blogs. Glad you accomplished this hike, and had that view as a reward! Thanks LB, you remember how tough Flat Top was? This was worse, but shorter and the view was excellent. No pain, no gain. Really enjoyed your blog! I laughed because it had so much in common with the hike I did this weekend :D. Keep up the good work! Thanks, just checked out your blog and left you a message!